The weather outside may consistently be freezing right now, but pretty soon we’ll be swinging into the spring and summer months, meaning heat, heat, and some more heat just to mix things up. Chickens can typically handle themselves in the heat just fine, especially if it’s a breed that excels in hot weather such as the Brahma or Rhode Island Red, but that still leaves some room for heat stress. You don’t want your birds getting anxious and uncomfortable when the weather gets too hot, so here are some tips to help them avoid heat stress. Heat stress is a condition that can occur in any breed at any time when the temperature and humidity suddenly rises, though as with most things the most susceptible are the young, old, and already sick. 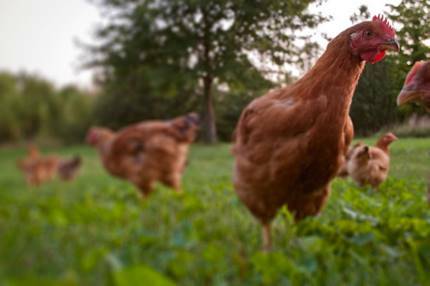 When a chicken is affected, their egg-producing abilities will take a dive, plus mortality rates climb in the overall flock. Simply, heat stress is a bad thing, so you’ll want to be prepared when it arrives. Oddly, a chicken’s normal body temperature is between 104 and 107 degrees Fahrenheit, so their preferred outdoor temperature is roughly 15 degrees less than that (90 at most). When the outdoor temp goes up, so does the poultry’s body temperature. If it gets up to 113 degrees Fahrenheit, then you know they’re in danger. As chickens can’t sweat, the best they can do all alone is pant excessively. That’s why it’s imperative to provide plenty of water for your flock to splash around in, drink, and overall use for cooling down. Keeping very cold water in a shaded area will do wonders to alleviate heat stress and should completely prevent much of the problem. Also, chickens, as with pretty much every animal, increase their body temperature during digestion. This means that they become warmer when eating, so feed them only at night or during the cooler times of the day. For the coop, ensure that it has adequate ventilation, installing a fan if necessary. Overcrowding it a huge source of heat (and stress in general), so more space for less chickens is best. Along with this comes the need to clean soiled bedding or litter as soon as possible seeing as how decomposing litter will generate heat as well. If you have a misting system installed in either the coop or the run, this will go a long way to cool things down, but if that’s not the case then consider keeping short grass in the chicken’s area. Grass that’s too tall will stop any sort of airflow, whereas bare dirt will only help spread the heat. Shortly trimmed grass allows the air to flow and the heat to dissipate. Simple, but effective. Again, the weather outside right this moment may be more ice and rain than sun and scorching, but it pays to be prepared for that inevitable shift. Don’t let your chicken be caught off guard by heat stress!